New study suggests majority of Israeli Jews back Israeli sovereignty in Judea and Samaria. A survey conducted by the Sovereignty Journal suggests that a large majority of Israeli Jews now oppose the two-state solution, with growing support for the application of Israeli sovereignty in Judea and Samaria. Also in the journal: There has been significant progress in the first and only Outline Plan (TAMA) to include Judea and Samaria as part of the State of Israel. There has been significant progress in the TAMA 100 initiative, the first Strategic Outline Plan to relate to Judea and Samaria as an integral part of the State of Israel. 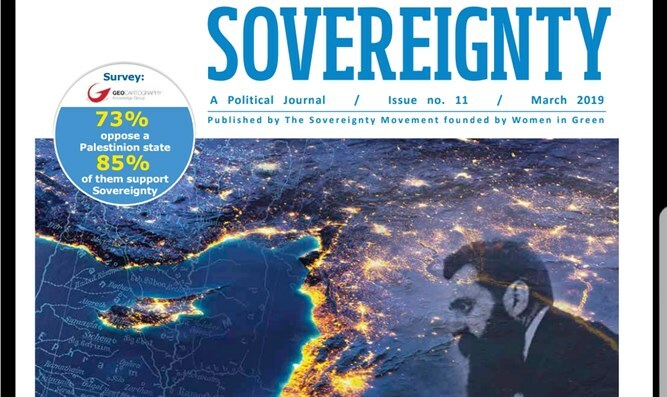 In the new issue of the Sovereignty Journal, to be published in the coming days, there will be a report of the significant progress that has been made in the special initiative being conducted by the Sovereignty Movement during the past year. The initiative comes after an interesting Haaretz poll this week showed support among Israelis (both Jewish and non-Jewish) for annexation beating out a two-state solution by 42% to 34%, with 31% of non-Jews backing either partial or full annexation of Judea and Samaria. The Strategic Outline Plan is being formulated by a team of experts in the fields of infrastructure, security, urban planning, the economy and more, led by architect Yoram Ginsberg. The Sovereignty Movement, which is behind the initiative, views the detailed plan as the flagship project that will turn the vision of Israeli sovereignty in Judea and Samaria into practical action which the Israeli leadership will be able to promote already in the next term of Knesset. The movement's leaders, Yehudit Katsover and Nadia Matar, note that for more than fifty years, no governmental plan has been formulated or presented that includes Judea and Samaria. "In the outline plan that we are working on now, there is, for the first time, a long-range view up to the State of Israel's hundredth year and even further. It is expected that in Israel's hundredth year there will be twenty million citizens and we must prepare for this soberly and in a timely fashion. The TAMA 100, which views the expanse between the sea and the Jordan River as one political and geographic unit, provides an answer for a balanced distribution of population in the entire Land". Katsover and Matar add that the plan includes the transforming of Jerusalem into a metropolis – a capital that will be the spiritual and physical center of Israel - as well as building new cities. In the new issue, data from a recent survey is presented, examining the positions of the Jewish public on the matter of Israeli sovereignty in Judea and Samaria, revealing: a majority of 73 percent opposes or vehemently opposes the idea of a Palestinian state and division of the Land. The survey, which was conducted by the Geocartography Institute, including 500 respondents, in the 3rd week of March 2019, also examined the preferences of those who oppose dividing the Land into two states. The results reveal the fact that 85 percent of those who oppose a Palestinian state would be interested in a solution of full phased sovereignty over Judea and Samaria. The survey also reveals that among the opponents of the "two states" idea, there is a plurality of 45 percent that support the application of sovereignty in the areas of Jewish settlement. 21.3 percent believe that sovereignty should be applied over all of Judea and Samaria and that a status of residency should be granted to the Arab residents of these areas. In contrast, there are only about 22 percent who support the establishment of a Palestinian state in Judea and Samaria. Only 8.5 percent are defined as strongly supporting this idea. The Sovereignty Movement, which is the body that publishes the Sovereignty Journal, is extremely satisfied with the results. "This survey testifies to the fact that our call for Israeli sovereignty in Judea and Samaria is the voice of the great majority of the Jewish People", say the two co-chairwomen, Yehudit Katsover and Nadia Matar, adding: "The survey leaves the leftist movements calling for division of the Land and establishing a terror state in its heart as a radical minority that is cut off from the People and from the views of the People". The movement calls on the Israeli leadership, during these days before the election, to view the voice of the People as a tailwind for a historical political step toward regional stability, and Israel's security and prosperity. "It is a privilege and an obligation for the Israeli leadership at this time to progress to the political step of applying Israeli sovereignty in Judea and Samaria, to strengthen our hold on our historic homeland", they say, noting the words of a very senior official in the prime minister's entourage in Washington, who said that the recognition of the American president of Israel's sovereignty over the Golan Heights is proof that Israel can hold territory that was defined as occupied, mainly because it is territory that she gained in the context of a defensive war that was imposed upon her.